Welcome to Myrons Tomos Assembly and Preparation tutorial. This is to help folks who live far from any Tomos dealer, who already bought or are thinking about buying a new Tomos moped, in the box. If you are not familiar with hand tools and mechanical work, then get someone who is to help you. These procedures are not for everyone. They’re for experienced mechanics and people who are skilled in using hand tools. Some procedures below, when mistakes are made, can result in injury or damage to the bike. Be advised. These instructions are for the pedal versions. Each of the six 2011-2012 Tomos models (Sprint, ST, LX, Revival, Streetmate, Streetmate-R) comes with either pedals, or footpegs with kick starter. For kick models, every instruction is the same except “pedal” steps 10 & 11 are different. Tools: 3, 4, 5, 6mm allen wrenches, with sharp corners, not worn (rounded), 19, 17, 15, 13, 11, 10mm open wrenchs, 8 inch crescent wrench, 12 inch crescent wrench, hammer, punch, box knife, scissors, #2 phillips screwdriver, plain screwdriver, air pump, a wratchet wrench with sockets 10,17 mm, and possibly a Dremmel high speed cutting tool for carving plastic. 1. Remove from box. Two people can lift it out without cutting the box. With one person, cut the whole side of the box off, and lift it out sideways from it’s crate, rear wheel first, then front. Then roll it away. Unpack and unwrap everything. Lay out small parts in organized groups. Learn what everything is and where it goes. Take inventory. If it’s a battery model, put the 12V battery on a trickle (1 or 1.5 amp max) charger for 30 to 60 minutes. Above, a 2011 Streetmate-R, unpacked. It’s about 95% assembled. All cables, wires, brake lines are attached and ready. Small parts box is unpacked on floor. From left to right, screwdriver and spark plug socket, 4 M6 allen bolts (5mm hex) for handlebar clamps, 4 M6 nuts, 2 handlebar clamps (black for Streetmate-R, silver for all others). Under those flat on the floor is the black tool pouch (that contains the handlebar hardware). Then one M5 button-head allen bolt (3mm hex) for oil pump cover, black plastic oil pump cover, black plastic left & right pedals. Behind pedals is battery and battery pads. Then two 9.5mm wedge pins for pedal crank arms, two M7 washers, two M7 nuts, pedal shaft right side parts, inner washer, spring, cup, and outer tube. Then right and left black pedal arms, left mirror, two keys, and the owners manual. 2. Install the handlebars. First put a little (1/2 a match head) grease on the threads of the 4 M6 allen bolts. Don’t let grease get on anything else. The four M6 handlebar clamp bolts go through the aluminum fork top. On the bottom side of the fork top there are four hexagonal holes for the handlebar clamp nuts. Hold (yourself or ask someone else to help) handlebar and clamp in position, then hold each nut with a finger tip, up in the hexagonal hole, while twisting the 5mm allen with fingertips. Both hand’s fingertips are feeling for the threads to engage, when they don’t, you back up, reposition the nut slightly, and retry. 2A. Install the speedometer. (for Streetmate, Streetmate-R, or Revival) These “battery models” have a speedometer mounted to the front two handlebar clamp bolts. First put the two rear handlebar clamp bolts on loose, first. 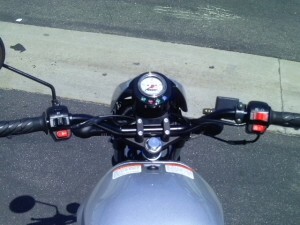 Then put the speedometer mount plate below the handlebar clamps. Then put the two front handlebar clamp bolts on. Position the handle bar in center, and with the brake levers angling in the direction of the riders forearms, or sightly more downward than that. So tall riders with low handlebars need their brake levers more downward, like 45 degrees. Short riders with tall handlebars need their brake levers more upward, like horizontal. Otherwise it’s difficult or uncomfortable to use the hand brakes. With high rise handlebars, rotating the handlebar changes the lever angle, but more importantly, also changes the distance from bars to rider, and the way the steering feels. It is suggested to position the handlebar so that it is slightly, about 5-10 degrees, forward of the plane of the fork. Tighten the front two handlebar clamp bolts fully. When all four bolts are on, clamps are even, handlebar is centered, and rotated slightly forward of the plane of the fork, tighten the 5mm allens fully tight, to 7 ft-lb. You need a sharp 5mm allen with a long (6″) handle, or a short handle extended with a piece of thin pipe or some other tool. With an improper tool it’s easy to slip and cause damage, like rounding out the hex-hole or scratching the paint or yourself. 3. Adjust the steering bearings. Most bikes have the steering adjusted too tight, where the handlebars like to stay in a straight ahead position, or the steering does not move freely. Check for this by sitting on the bike, on the centerstand, so that the front wheel is in the air, and feel the effort needed to move the handlebars from side to side. They should move freely and not have any tight spots, especially in the center position. If the steering feels too tight, loosen the top steering nut “crown nut” with the 12 inch crescent, then tap the notched cone, below the nut and below the fork top, with a hammer and pointed punch, to rotate it counterclockwise about 1/4 turn, or as needed. Then re-tighten the crown nut (steering lock nut) to 30 ft lbs, and then re-check the steering movement. When the steering is too tight, it is not possible to ride or walk the bike, and steer it by slightly leaning, with no hands on the handlebars. When the steering is too loose, when the front brake is first applied the front of the bike will jolt or judder, as the front end shifts in the frame because of too much play in the steering bearings. 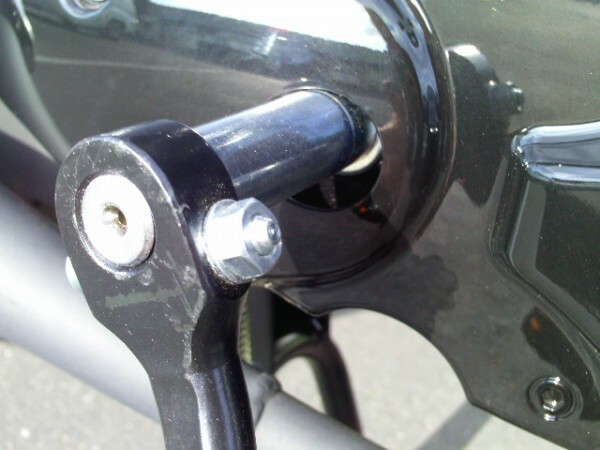 Without riding the bike, you can detect a loose steering by placing your fingertip across the gap between the frame bearing race (cup) and the fork bearing race (cone). The two things should turn but should otherwise feel completely solid. 4. Install the oil pump cover. (non-Sprint models only) It’s tab goes in a slot and then it rotates counterclockwise to lock in, held by an M5 allen bolt, 3mm wrench size. Tighten to 4 ft lbs. First check the oil lines for kinks, leaks, or air bubbles. The blue or green colored oil is visible inside the 1/8″ ID clear oil hoses. The oil pump cover is not installed by Tomos, so that the final assembler will notice if there is air in the oil lines or blue two stroke injector oil leaking. The left oil line (into pump) is from the oil tank under the seat. It’s the “supply line”. The right oil line “output line” is from the pump to the carburetor. At the far left is the M3 bleed screw. 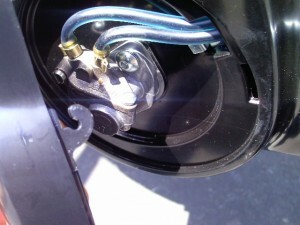 When the bleed screw is removed, oil (and air) will drain out of the supply line (as long as the oil tank is not empty). It takes a couple of minutes to bleed the supply line. The output line cannot be bled. Only on a used bike that has been ran without oil in the tank will the output line have air in it. To elimate air from the outlet line, you run the engine on 50:1 premix for a couple of miles, or about 10 minutes. When the outlet line is full of oil, you replace the premix gasoline with straight gasoline, so it doesn’t smoke from twice as much oil. 5. Install the mirror. Grease the threads first. Lock the two 13mm nuts to each other, in the right location, to make it possible to take the mirror off and on without tools. If the threads in the hole get damaged, use an 8mm x 1.25 tap, with oil, to repair the threads. 6. Install the fairing brackets. (ST and LX models only) The two shiny metal brackets, a few inches long, go from the headlight holder M6 clamp bolt, hex head, downward and outward to the lower fairing sheet screws and “clip” nuts. From outside to inside, goes: the bolt head, the bracket going down and out, the M6 washer, the chrome headlight clamp/holder, and on the back inner side of that, the M6 nut, which requires a strong squeeze with strong fingers or channel lock pliers, to get started. Position top of headlight holder close (1/2 to 3/4 inch) to the top of the fork tube, and tighten the first side enough to keep it from sliding back down while you’re installing the bolt on the other side. Once both sides are on correct, align them to make headlight point straight and level, left to right. Then tighten to 6 ft-lb. 7A. Install the front turn signals. (for Sprint, ST, LX) For Sprint, M10 bolts substitute for turn signals. Remove headlight to work on turn signals behind it. Leave wires plugged in. Install turn signals, 17mm hex nuts. Rotate “dash” back towards the rider, so it hides the cables and faces the rider. Tighten the turn signal nuts, to about 8 ft-lbs. Align the turn signals so they point straight ahead and don’t look goofy. Put the headlight back on. 7B. Install the front turn signals. 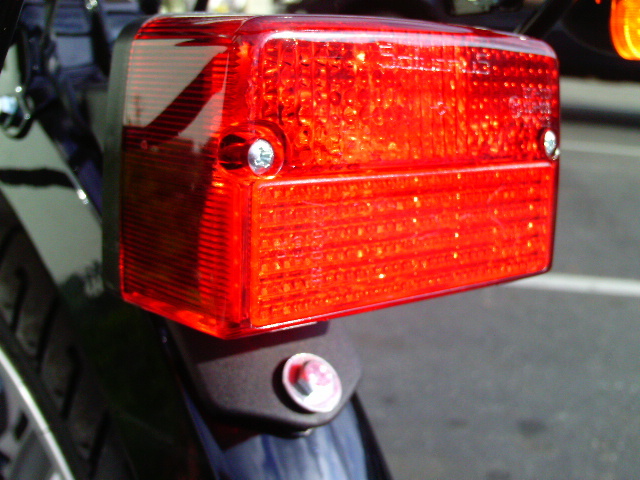 (for Revival, Streetmate, Streetmate-R) For Streetmate-R, to make the front turn signals look nicer, grind or cut off rubber nubs on turn signal, that are supposed to go into holes. Without cutting them, they dont sit flush against the headlight mounts, which have to holes for the nubs. Install turn signals, 17mm hex nuts. Tighten the turn signal nuts, to about 8 ft-lbs. Align the turn signals so they point straight ahead and don’t look goofy. 8. Position the cables and wires. 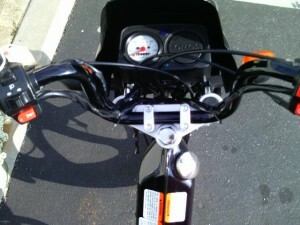 Pull the zip ties around each upper handlebar, down to the lower part, to tuck in and hide the wires. It’s OK to kink electrical wires, but it’as never OK to kink control cables. They need to bend the least possible. Position speedo cable so it’s not hanging out, and where it goes as straight as possible. Sometimes it needs the front axle nuts, 19mm hex, loosened and the speedo driver repositioned at a different angle to make the speedo cable less bent. Left, ST, right, Streetmate-R, handlebar, speedo/dashboard, cables, and wires positioned and routed correctly. 10. Install the fairing. Two upper M6 cap nuts & washers, and two lower sheet metal screws and M5 washers. For Streetmate-R, the fairing is already installed. Just rotate the fairing and the dual headlight back so the top of the fairing is close to the speedometer, like shown above. Aim the headlight so it points to the ground about 50 ft ahead of the bike when the tires are on the ground. Move either the right or left headlight mount up or down the fork to center the fairing left to right. Then tighten everything. 11. Install the pedals onto the pedal arms. L is left thread. R is right thread (clockwise = tighten). Easy to confuse R & L.
11A. Install the left arm onto the left pedal shaft. Push in the wedge pin. It may need wiggling or light tapping. Strike the head while holding a weight against the back of the pedal arm, to seat the wedge. Then tighten the M7 nut (11 hex) to 8 ft-lbs. 11B. Install the right arm and pedal shaft pieces, innermost first: the washer, the coil spring, the cup, and the finger-size tube last. Then with the left side pedal straight down, push the pedal arm onto the shaft, with light tapping, then push the wedge pin in, with the head pointing the opposite direction as the left side. Some wiggling and light tapping are all that’s normally needed. Again, strike the head while holding a weight against the back of the pedal arm, to seat the wedge, and then tighten the nut. 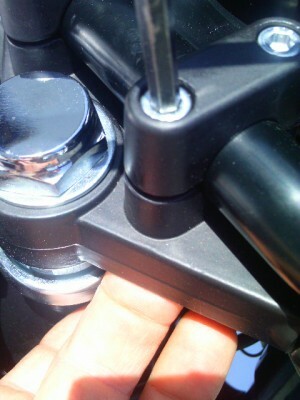 Above, the right pedal shaft hole is sometimes not centered very well. The plastic must be cut or melted. 11C. Sometimes the plastic engine cover needs to be removed, or even trimmed (cut) to make room for the pedal shaft washer and pieces. A Dremmel high speed cutting tool can make the hole bigger on one side, usually in the 11 o’clock position, like shown here. A more primitive way is by melting with a hot knife or screwdriver, not recomended for everyone. 12. Install the rear turn signals. (for ST & LX models only) Make sure wires are plugged in good, and they don’t easily unplug. Tighten 17mm hex nuts. Battery models Revival, Streetmate, Streetmate-R come in a wider box with the rear turn signals already installed. 13. Air up the tires. 40psi rear and 35psi front. Put some 91 octane gas in the tank. Put some 2-cycle oil in the oil tank. 14. Start the engine. Put the choke lever up. Put the gas valve on reserve. Kill switch on “on”. Kick it several times, with no throttle. After it starts and runs for maybe 10-20 seconds, then flip the choke lever down to put the choke off. If it fades out when throttle is opened, then put the choke back on again for a few seconds. After it runs for a few minutes, it should idle OK, not well, and start easy, in one kick. Once the engine gets over 10 miles, it becomes “broken in” and the idle and ease of starting get better. When they are brand new, they take several kicks to start. After the initial break-in, they always start on the first kick, hot or cold (with choke). 15. Check everything. Lights, brakes, horn, transmission, controls. Test ride and get used to it. Isn’t it fun? Above, close up of 2012 tail light, made by Saturnus, not the 1977-2011 CEV one. 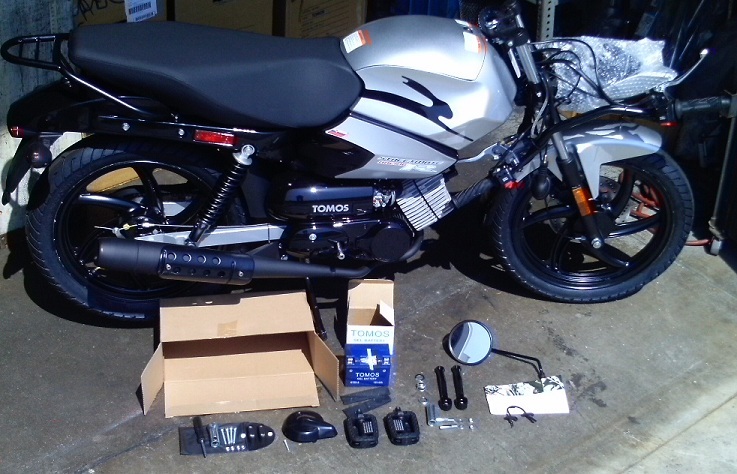 After the new Tomos moped is assembled and operational, there may be some optional things to do to make it better. 1. Round off the brake cams. 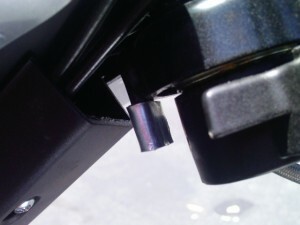 Many of the drum brake cams, 2008 and later, have sharp corners that need to be rounded to make the brake work better. Whenever the wheel is off, the brake cam should be checked. At left is a brand new brake plate (panel) assembly, showing the brake cam. It’s the thing that pushes the brake shoes apart when it rotates in the direction that the cable pulls it. 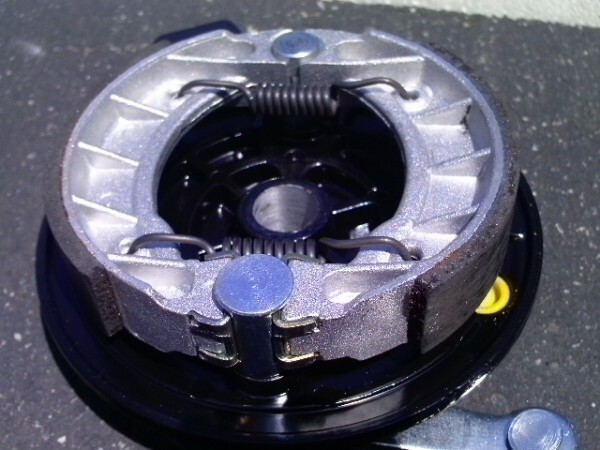 From this view, the cable pulls upward, causing the brake cam to rotate counterclockwise, which causes the lower right edge to push the right brake shoe outward, and the upper left edge (not visible) to push the left brake shoe outward. So only two of the four edges of the brake cam are active. The two edges that don’t do anything don’t need to be rounded. 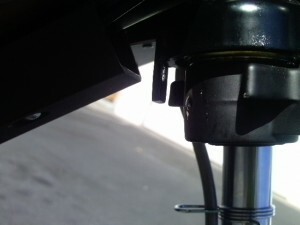 Left, a not-rounded brake cam. Right, a rounded brake cam, after grinding and filing. The other rounded edge is catty corner to the one shown. Reinstall the brake shoes like folding a taco into a tortilla. Rotate the cam backwards to expose the parts that rub against the brake shoes, then apply a tiny speck (1/2 a match head) of grease on those two areas only. The 105mm Tomos brakes are fine without this. Even without rounding, they stop better than most other moped brakes with 80 or 90mm drums. But with this done they’re awesome. A properly rounded Tomos front drum brake can stop almost as fast as a Tomos front disk brake does, in about 3 or 4 car lengths from 40 mph. You can’t tell if the brake cams need rounding, except by looking directly. Once rounded, a rear brake will skid with two fingers. Be advised. It takes more skill to use the brakes hard. It’s easy to skid and fall down. See the Safety department. 2. Check the rear brake, maybe add washers (for Sprint, ST, LX) On the 2008-later box style swingarm, the brake plate anchor post is so long that one or two 12mm washers need to be added to space out the brake plate. Most 2008- early 2009 did not come with washers. They either had to have their back wheel adjusted crooked, where the front is to the left, or their brake was rubbing, slowing the bike down and maybe squealing, because their brake plate changed shape when the axle nuts were tightened. In 2010 and after, one or two 12 x 18 x 1.5mm thick washers were installed, between the brake plate and the swingarm. The parts manuals do not show these. 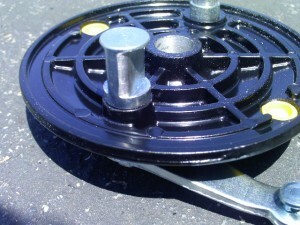 When there’s not enough washers, the wheel cannot be centered in the frame without making the brake rub. When the wheel is centered, axle nuts tight, it spins freely with the chain off, and the brake works and doesn’t stick, then it’s all proper. 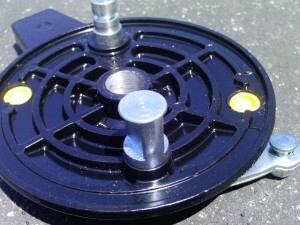 No other moped wheel and brake is as strong, long lasting, precise, and well made as a modern Tomos aluminum wheel. 3. Paint a white arrow mark on the black gas valve. Now you can tell easily if the gas is on, off, or reserve. 4. Check the steering stop, maybe make it wider (for Streetmate and Streetmate-R) Some 2008-later Streetmate-R models need the steering stop made wider, to allow the fork to not hit the faux tank when turned fully to either side. Left, the original Streetmate-R steering stop. Right, with adaptor piece installed to make it wider. Above, left and right steering travel should be limited by the solid frame stop. Nothing else should touch. There’s no easy way to make a steering stop wider. Myrons does this: A strip of metal is formed into a loop, welded shut, and hammered onto the frame. It’s hard to guess the right size and shape to make it a tight press fit. Here’s one that has been formed and fitted, but has not yet been welded into a solid loop. 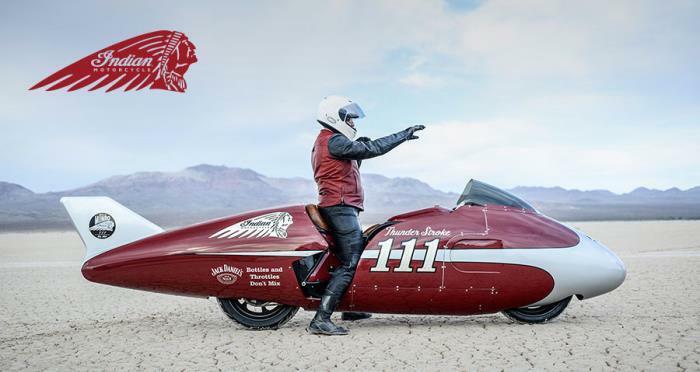 Roland Sands new Indian streamliner “The Spirit of Munro” Click here to see more. Welcome, friends of tiny pistons. If you want a reliable, clean, safe, easy, cost-effective way to get power, or torque, read on. If you want to go real fast, like over 45 mph, make noise, clouds of smoke, spend a lot of money, and leave a trail of blown-up engines and ruined parts, then you can read how to do that elsewhere. The low-emission low-friction Tomos A55 stock engine is happy going 40-45 mph, all the time, for many thousands of miles, and occasionally hitting 50, with minimal modifications. Shaun has done much research on enhancing the performance of the 2007 Tomos A55. The result was the A55 engine already is very efficient, so much that it was too powerful and needed an intake restrictor and a excessively big back sprocket to keep it under the legal limits of speed and power. The A55 is a low emission two stroke engine with modern technology. Tapered curved directed nozzle transfer ports, low-friction, high strength cylinder wall, with big all aluminum cylinder for better cooling, oval venturi carburetor with multiple jets. Needle bearings on both rod ends, a third outer crankshaft ball bearing, splines for the clutch hub, make the Tomos A55 engine durable, efficient and also easy to service. MAGICAL AIR BOX: If you run it without the air box, and with a bigger jet, it goes maybe 1/2 mph faster, but looses a lot of low end torque, and climbs hills worse. Put back the stock 55 jet and air box, but cut the “elephant trunk” off of the rubber connector between the carburetor and the air filter, and round out the rubber into a bell, instead of a reverse bell. The still air in the middle of the frame is somehow easier for the engine to breathe in, than the moving air outside. Flip the stock air box 180 degrees, so the outlet is facing out, instead of into the hole in the frame, and the bike looses power, about 1 mph. Anything else you do, like drilling holes in the air box, making the 17mm inlet tube 19mm, making it 15mm, or running a hi-flow foam filter, causes a noticible loss of accelleration and power. Apparently Tomos has found a shape and size that silences the intake roar, houses the air filter, and somehow helps the engine breathe better at low to mid rpms. All of the development to make the A55 meet 2006 US EPA Pollution Standards had the side effect of making more power. Here is a link to 50cc racers. They are not mopeds, but their pistons are the same size. Back in the 1970’s, 50cc racing motorcycles all went over 100mph, even the slowest ones. At the Hockenheimring in Germany the fastest ones averaged 126mph! A 50cc racer can produce 18 horsepower, while a 50cc moped makes less than 2 hp. That is because a moped is a power-limited-50, spinning to only 6000rpm. While the racer with a 6 speed transmission spins to 18,000 rpm. The racer gulps three times as much air in each revolution. The combination of 3 times the volumetric efficiency times 3 times the rotational speed, accounts for the 9 fold difference in power. It’s better to start with something that’s not limited. Unlimited stock 50cc bikes like a 1982 Honda MB5, and some automatic 50cc sport scooters, like a 2003 Aprilia RS50, already do 45-50mph. It is better to let Honda or Aprilia do the engineering and development, than to think you can make it better than them. Sure you can make it faster, but at what price? You will likely loose something like money, reliability, convenience, operating cost, or gas mileage. The big companies have already considered all of the possible modifications, and perhaps even built and tried some of them, but decided not to make their bikes that way for a reason. You are currently browsing the archives for the Assembly and Preparation category.